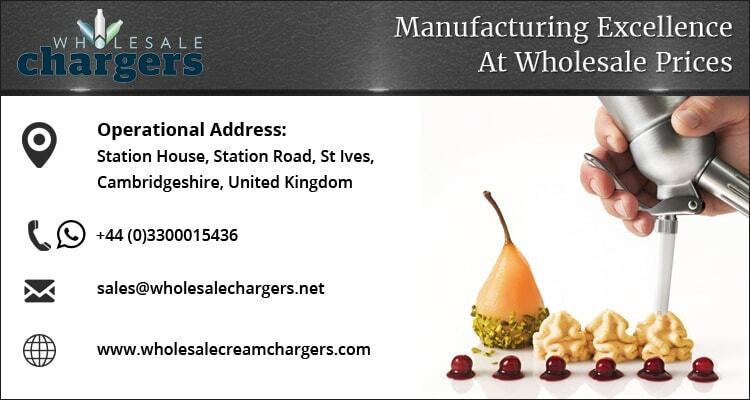 Mosa Cream Chargers are available in packs of 12, 24 and 50. Allowing you to whip up a whole host of tasty savoury and sweet treats, these Mosa Cream Chargers are available in a variety of different pack sizes, including bundles of 10, 24 and 50. Fitted with N20 Nitrous Oxide gas, which is used throughout the catering industry due to the fact that it is a tasteless, non-flammable, and colourless gas that stops the growth of bacteria, Mosa cream chargers have the capacity to turn 1/2 litre of whipping cream into up to 1.5 litres of whipped cream, quickly and effectively! So just one cream charger is able to whip up to 0.5 litre of liquid, whipped cream, desserts, mousses, or sauces! And, to ensure that the charger is able to stand the test of time in even the most demanding and challenging kitchen environments, all silver lacquered chargers are nickel coated so that exposure to moisture does not cause them to rust. Please note: for B2B business a minimum order of 600 chargers applies and for B2C retail sales, a minimum order of 24 chargers applies. All orders are subject to our Terms of Business as shown on this website and in accordance with strict adherence to the mis-use policy as detailed below. Mosa are one of the top manufacturers of disposable compressed gas cartridges, unrivalled for price and quality. 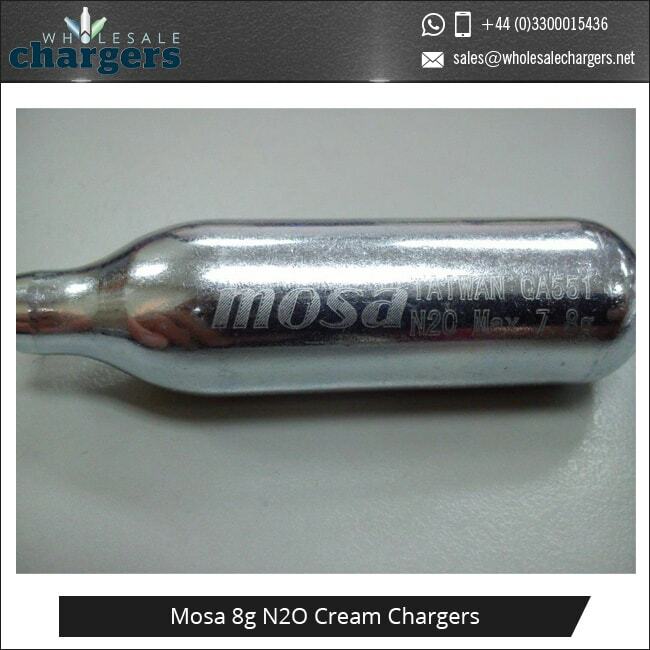 From its founding in July 1988 by Charles Wang, Chairman of Mosa Industrial Corporation, Mosa have produced the highest quality Cream Chargers, CO2 Cartridges, Cream Whippers and Soda Splash and Siphons. Their products are used by our customers in food and beverage, medical, lifesaving, automobile and the sports and leisure industries. German TüV-Mark Certified N2O charger production from a factory which is also NSF, ISO 9002 certificated. Mosa products are only supplied to United Kingdom, Ireland and Spain and cannot be re-exported or sold to any other country. Alternatively, we can arrange to repackage the cartridges ourselves on your behalf, adding any designs you wish before we deliver them.